A new initiative at B-L High School aims to help less fortunate members of the Batesburg-Leesville community. The school’s Needs Pantry opened up this year and serves as a place where individuals in need can shop for life essentials such as food, clothing, shoes and hygiene products, all provided at no cost to them. The program was started by B-L High School’s Counseling Department as a means of providing for the district’s oldest learners, who are sometimes less likely to ask for help when they need it most. The program has grown, though, beyond the walls of B-L High School to include families and community members who might have fallen on hard times. 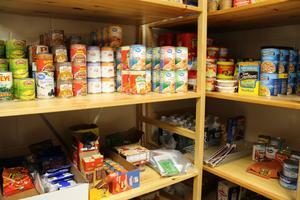 Individuals who would like to shop in the Needs Pantry can do so anonymously. All they have to do is stop by or call the B-L High School Counseling Department to set up a time to do this. Students who are concerned about their peers knowing they are using the Needs Pantry also have the option of shopping before or after school, when their classmates are not present. In addition, all of the items that an individual decides to take with them are placed in a discreet, non-identifiable bag. Donations are accepted and welcomed for the Needs Pantry. Anyone who would like to make a monetary contribution can contact the school at 803-532-9251 for additional instructions.